There must be a reason for this reroute. It may make more sense in the future to run the bus down Funston instead of Park Presidio, but I have to think there's a good bit of ridership that takes the 44 and then transfers to the 38 to get to the 28. Maybe they figured it makes more sense to provide some access down Clement and California instead of running another bus down Geary for those few blocks. But then, I'm not sure there's any sense to many of the changes MUNI makes. According to the TEP, Muni eventually wants to electrify the 2, essentially turn it into the 4. However, wires only run down California, not Clement, to 8th. Maybe with the 44 running down Clement to Park Pres, it cover that portion of the 2 should the line be electrified. The problem with the 44 route is it only goes one way, west on Clement. The 44's route is supposed to just circle around so its return trip goes south on 6th Avenue in the Richmond. I guess they're looking for a quick connection to the 28 (without using the 1, 38, 31, or 5...or from the Marina, the 43). Still, it seems to subject the route to several slow, congested blocks for not much benefit. Wasn't aware there was such a need... Compared to the 2 Clement, which circles around via 14th to Geary to 15th WITHOUT stopping on Geary (making it necessary to walk 1 block to connecting lines, or get dropped off secretly by a friendly driver), this will at least offer a little new connectivity. 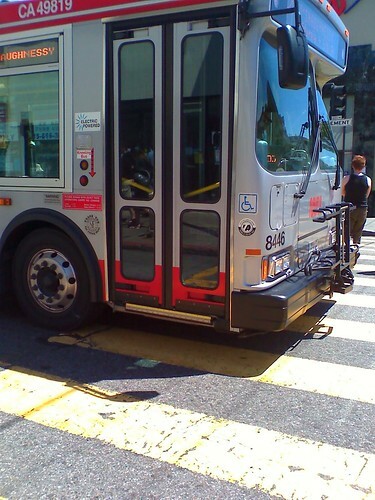 @Ben in SF: This change has the 44 stop at Calif and 12th, which is still a block walk to the 28. There was a conflict on 7th Avenue between parents double-parked waiting for their kids to get out of the grade school on that block and the 44 line coaches. Instead of setting up a system to regulate the parents in their cars (remember the Transit First policy of 1973?) Muni decided to reroute onto 8th Avenue. The residents of 8th Avenue complained (after all, they moved to 8th to be near, not _on_ a bus line). So Muni looked for the nearest street without houses: Park Presidio Boulevard. It's a classic case of Muni bending to a few loud complaints instead of doing what's right and best for transit service.